Coffee is the most traded commodity in the world after oil and illegal drugs. However during the past decade, prices paid to coffee farmers fell to a 30-year low with as little as 3 cents from a $3 cup of coffee reaching the farmers who grew the beans. Worldwide, 25 million small-scale farmers and their families have been affected. This is to be contrasted with continuing profits in the billions, for companies such as Nestle, Kraft and Sara Lee. In 2010, Nestle, the worlds biggest food company, recorded a net profit of 34.2 billion francs (AUD $34.8 billion), three times the 10.4 billion francs it earned in 2009. 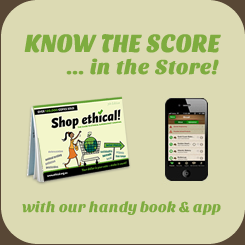 Look for products with the certified Fairtrade symbol. Buying Fairtrade coffee ensures farmers get a fair deal: "a minimum price of AUD $3.80 per kilo compared to the local price of about AUD 65 cents". Some Coles and Woolworths/ Safeway supermarkets stock Scarborough Fair, Global Cafe Direct & Republica fairtrade brands. Organic systems recognise that our health is directly connected to the health of the food we eat and ultimately, to the health of the soil. Organic farmers aim to produce good food from a balanced living soil. They severely restrict the use of synthetic chemicals, pesticides and fertilisers. Animals are reared without the routine use of drugs including synthetic growth hormones, antibiotics and wormers, which are commonly used in intensive livestock farming. The ecoCaffe Company is a 100% Australian owned company that exclusively distributes the Ethical Coffee Company espresso's in biodegradable coffee capsules for Australian consumers. Their range includes Fairtrade and organic options. Sacred Grounds brand is certified Organic (by NASAA and ACO) and licensed by Fairtrade Labelling Australia and New Zealand to sell products bearing the FAIRTRADE label. Offering a range of coffee blends and origins and a variety of Loose Leaf Teas, Teabags, Drinking Chocolates and Chocolate Bars. Your one stop shop for fair trade and organic tea and coffee. Online sales. Tradewinds is a volunteer based not-for-profit company, with profits funding targeted projects that open new opportunities for producer communities. WithOneBean coffee is ethically, socially and environmentally sourced from a cooperative of subsistance farmers in Timor Leste. 100% of the profits from coffee sales goes to environmental and educational projects in Timor Leste.